Configure an unlimited amount of laboratory instruments, test points and manage compounds and test methods in a categorised manner. Complete with the option of manual data input or automatic data parsing of a registered laboratory instrument, with flexibility to manipulate and export test result data. Our Universal Instruments acquisition software caters for the need of converging important laboratory data into one electronic data process. 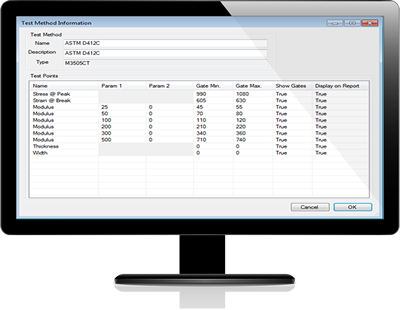 This software enables the manual entry of data from independent instruments that do not have the capability to electrically log data to a configured database. All manual laboratory equipment and non-Labline configured instruments such as: Testometer, Durometer/Hardness, Density Meter and specific gravity can be registered as a generic instrument into our system. In addition to the manual data entry facility Prescott Instruments can also provide bespoke modules for automatically capturing file data from a variety of instruments and other software applications. This innovative software suite facilitates the registration of any number ‘generic’ instruments, configures predetermined test definitions and transcribes data into an ODBC database. Microsoft SQL Server ® and IBM DB2 ® databases are supported, with the option of being networkable. Integrated with the Labline database. The instrument configuration flexibility allows any type of autonomous instrument that does not have the capability to electrically transfer data to be setup as manual entry. Equipped with file monitoring tools and file data parsing facilitates modules for automatically capturing file data from a variety of instruments and other software applications. This features requires bespoke modules, please contact our software support team for more information. This software is fully supported in our FlexiReports package, that collates all Universal Instrument data and Labline into one report system. Test Points can be configured to automatically pass or fail tests based on predetermined gates. Limits can be added and recalculated at any time. Test Results can be exported into a wide range of file types such as .csv, for further analysis using Microsoft Excel ®, Quality Analyst SPC or any other analysis tool. Three levels of security have been built into the software, which contain managerial, supervisory and basic privileges. The security system allows users and passwords to be configured and once active can only be disabled by a manager. These supported databases are widely available and offer express and commercial products depending on your needs. Complete with database maintenance tools to enhance processing performance. The functionality of the supported databases allows a smooth and rapid flow of data between our software packages; Labline, FlexiReports and Universal instruments. Please enquire for more details.